Unmanned mine countermeasures systems appear to be finally coming of age. 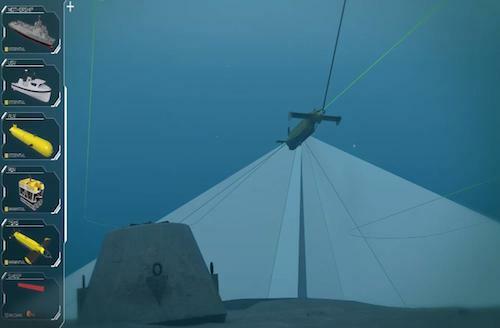 This week at Euronaval in Paris, Thales will unveil its Pathmaster system, which it describes as the first fully configurable unmanned mine countermeasures system for naval forces. Pathmaster, which features Thales’s latest generation, high-resolution synthetic aperture radar, can be operated from shore, a mine countermeasures vessel or any other naval platform, says Thales. It can be used for detection, classification and location of mines and can be tailored to the needs of individual navies, whether emerging naval powers or already well-established maritime forces. Pathmaster can be automatically deployed and recovered and requires minimal training. The solution was evaluated by the French defence procurement agency, DGA, in 2016. The Maritime Mine Counter Measures programme is a joint France-UK initiative to develop, manufacture and qualify two unmanned systems. Under the programme, Thales, in collaboration with BAE Systems and its partners (ECA, ASV, Wood & Douglas, SABB), will make available for two years systems for operational evaulation by the French and UK navies. Each system will consist of an unmanned surface vehicle equipped with an autonomous navigation system, an obstacle detection and avoidance sonar, a threat identification and neutralisation capability based on remotely operated vehicles, a Towed Synthetic Aperture Sonar and an autonomou underwater vehicle. AUSS can move in any direction and can conduct missions that last several weeks and span hundreds of kilometres. It is designed to be launched and recovered from any vessel. Thales says sea trials of AUSS were conducted five times in 2016 , confirming the system's ability to perform a broad range of missions. 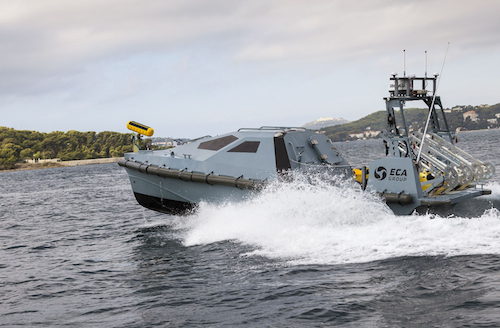 France’s ECA Group has also launched a range of solutions to cater for navies’ growing interest in unmanned mine countermeasures. The French company says it has delivered fully robotised unmanned mine countermeasures systems to two navies since the beginning of the year. ECA’s solution reduces the need for traditional mine hunting vessels to be deployed close to the mine hunting area. Instead high-resolution sonar fitted to autonomous underwater vehicles or on “surface drones” is used to detect mines. Inspection robots and mine disposal vehicles are then deployed from an unmanned surface vessel or mother ship to destroy the mines. Also at Euronaval this week, Thales and 19 French SMEs will launch the Autonomous Underwater & Surface System (AUSS), which it describes as the world's first hybrid unmanned system capable of operating both above and below the surface of the water. AUSS is designed for a broad range of civilian and military roles, including intelligence gathering, maritime counter-terrorism, mine countermeasures and surveillance and offshore plateforme surveillance. Nineteen French SMEs worked alongside Thales to develop the conept over the last three years.